Safety experts bet Bayer will soon end sale of Essure in the U.S.
(Story updated at 3:07 p.m. ET) Bayer will stop selling its sterilization device Essure outside the U.S., the company announced late Monday. Safety experts think Bayer's decision signals it will soon be gone from the U.S. as well. Thousands of women have sued Bayer, claiming the device caused them severe health issues. The German-based company said the decision was made for commercial reasons and wasn't related to safety. The company claims "there is not as much patient interest in permanent birth control" in global markets. In May, sales of Essure were suspended in several countries including Canada after patients reported serious and sometimes debilitating complications such as allergic reactions, persistent pain, abnormal bleeding, perforation of the fallopian tubes and the need for surgery to remove the device. The Food and Drug Administration said in a statement that it has confirmed with Bayer that it will continue to conduct a study of Essure's benefits and risks and how it compares to tubal ligation. The FDA added that women considering using Essure should be informed by their provider of the potential risks and benefits associated with the device. The black box warning will also stay in place to ensure women understand there are risks. The FDA mandated the warning label, the highest-level alert, in 2016. Patients and their advocates continue to call on the FDA to remove Essure from the U.S. market. Demands for more research about the effects of the device are also being made. "What's particularly important to patients who do have Essure is that there be research as soon as possible to show them what the risks and the benefits are over the long term regardless of what country is still selling Essure," said Diana Zuckerman, president of the National Center for Health Research. 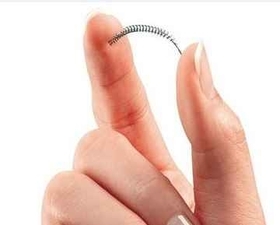 Essure consists of two sets of tiny coils that are implanted in a woman's fallopian tubes. Scar tissue is supposed to form around them, securing the coils and blocking the tubes so that eggs cannot be fertilized. Essure was temporarily pulled off the market within the E.U. this summer. The devices were then recalled by some EU countries. Bayer's decision to remove the device from all European markets likely signals that Bayer will pull it from the U.S. as well, said Erik Gordon, a professor at the Ross School of Business at the University of Michigan. "I think...that the product isn't important enough commercially for Bayer for it to continue throwing money at lawyers to keep it on the market," he said. Last year, litigation costs and impairment losses to defend Essure cost Bayer $413 million. Roughly 3,700 women have filed lawsuits against Bayer. Bayer doesn't report annual sales figures but said it has sold 750,000 Essure devices since 2002. The 750,000 figured hasn't changed for at least four years. Bayer reported $48 billion in revenue last year. Art Sedrakyan, a professor of healthcare policy and research at Weill Cornell Medical College who has studied the device, said he wouldn't be surprised if Bayer voluntarily stops selling Essure. The negative publicity and stagnant use around the device might push Bayer to decide its no longer worth it to sell from a financial standpoint. There is also evidence that physicians are recommending Essure less to patients as news of the health risks grow. "Doctors don' want to be sued," Gordon said. Bayer also probably decided to remove Essure from European markets first because foreign governments are more likely to pull a product that has negative clout compared to the FDA, Gordon said. Australia withdrew the device earlier this month after a government alert warning that women suffered unintended consequences from Essure including chronic pain and bleeding. Brazil made a similar decision in February. Gordon said the FDA is acting in accordance with its federal obligation to not be swayed by outside pressure to approve or pull a device from the market. The agency is obligated to assess all drugs and devices based on their benefits and risks. The FDA has been transparent about the risks associated with Essure considering its decision last year to mandate a black warning label on the device, Gordon said. The move by the FDA is "a pretty big step" and "the thing that every device and drug company tries to avoid," he said. CORRECTION: An earlier version of this story had an incorrect headline. Apologies for the error.